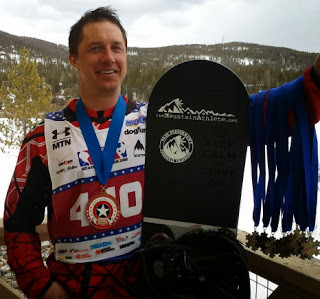 Early in March 2013, I moved to Breckenridge, CO to Coach at Breck and train for USASA Nationals coming up in April. Being on snow 6 to 7 days a week for 5 to 6 hours a day forced me to move my gym training (x4 days a week) to the evenings (I usually work out in the early mornings). With this physically demanding schedule, nutrition and recovery were going to be vitally important to my success. I was used to taking pre-workout supplements that have lots of caffeine and other ingredients that were designed to get you ‘amped up’ for training, etc. While the mental ‘buzz’ was always a sign that it was taking effect, that didn’t always guarantee a strong workout. Sometimes I’d perform well, and other times not so well. Prior to moving to Colorado, I had to cut back on my morning coffee as it started to be too much caffeine on a daily basis. And there was no way I could use this kind of stuff at night otherwise I’d be awake until 2:00 AM every night. I was ready for something new and looking for a supplement that was more reliable and didn’t have caffeine or any ‘get super pumped-up’ ingredients. A friend introduced me to Generation UCAN, and after telling one of the owners about what I do, magically produced a large bag of sample packs for me to try. I didn’t know much about the science behind the SuperStarch, but was interested in checking it out. I started taking one of the flavored packs before gym workouts and put a serving of the plain into my morning shakes. I couldn’t ‘feel’ the UCAN take effect like the caffeine rush of other pre-workouts, so I kind of forgot about it when I started training. After a few weeks though, I had put together several strong workout sessions and was not feeling any signs of overtraining. I continued to get stronger and my conditioning steadily improved as well. I was putting in some solid hours on the snow every day and did not feel fatigued from the increase in weekly physical efforts. This consistent training performance was sustained all the way up to Nationals practice week. I used UCAN during my practice days and again was able to ride strong throughout the entire session each day without feeling fatigued in the evening. I had just enough sample packs to use UCAN on race day too. I ended up qualifying 2nd and won my first heat and then won the finals to take the Gold Medal for Boardercross in my age group. I made what then seemed like a random comment to our wax tech after the finals - that I felt like I had 5 or 6 more strong race efforts in me, that I wanted to keep riding. It only occurred to me after learning more about Generation UCAN and how it works, why I had the training and competition performance I experienced. It is designed to provide consistent energy over a reasonable period of time (besides stable blood sugar levels, tap into body fat stores for energy, etc.). And that’s exactly what it did for me. I was so used to the caffeine rush sensation that I automatically assumed that I would ‘feel’ the UCAN kick in. Instead, I should have been looking at my performance for evidence that it was working. I remember being able to do difficult sets in the gym and then step up to do the next one, and the next one and the next. I never failed to get my gym or on-snow training work done and was strong during every session. The Nationals results speak for themselves. I’m psyched to be an Ambassador for Generation UCAN and encourage both strength and endurance athletes alike to give it a try. I use the protein version before and after my gym sessions and regular UCAN in my morning shakes and/or oatmeal before on-snow days. The results are great and I get to enjoy my coffee again! I also like that it’s produced from a real food source (corn). Check out this Generation UCAN link for more information, to learn about the UCAN story and how it can help you perform better. You can also click on the icon at the top right of the page to get a 10% discount on any UCAN product order (be sure the promo code - UCANELITEJB is entered before checkout).